So OBJ drops a third-down Eli pass that would've picked up the first down, and the #Packers will get the ball on a punt. #Packers are going with Gunter and Randall at CB, Hyde at nickel. In dime, Brice comes in at safety, Burnett or Ha Ha shifts to slot. #Packers had to waste a timeout because it had too many men on field for that Giants punt. In game 17. Packers open with Cobb, Adams, Nelson, Cook and Montgomery. Giants brought Janoris Jenkins into the flanker spot to match against #Packers WR Jordy Nelson on third down. Something to keep an eye on. #Packers go three and out to start the game. Jared Cook targeted twice, no snaps for Geronimo Allison. Randall Cobb back on the field. Not a great punt from Schum, but fortunate to get a nice roll. #NYG take over at their own 38. Wrinkle to keep an eye on for the #Packers : Even with Randall Cobb back, Jordy Nelson was in the slot on that drive. Cobb was outside. LaDarius Gunter is following OBJ. #Packers CB LaDarius Gunter is matching against Odell Beckham Jr. He's giving up a speed disadvantage, but he's their best corner. Two drops for Odell Beckham Jr. That one was a touchdown. His plane is late arriving from South Beach. 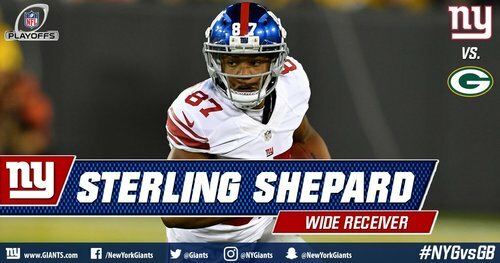 Maybe a tough grade but a player of OBJ's caliber? That's a drop. Would-be TD makes two drops for him already with Gunter shadowing. Remember, dropped passes were a big part of #Packers loss to Giants in 2011 divisional game. Giants dropped a pair of TDs on that drive. Drops kill that drive for the Giants. 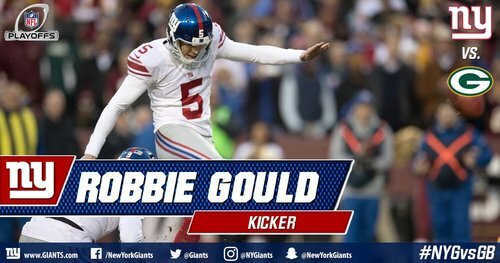 Robbie Gould hits a 26-yard field goal to get them on the board. #Giants 3, #Packers 0. #Packers DBs are overmatched today. If Dom Capers can't figure out how to pressure Eli Manning, they'll be sitting ducks. #Packers fortunate to get the benefit of some #NYG drops to this point. #Giants settle for a 26-yard field goal and it's 3-0. #Packers receivers can't get open quickly, and Giants can't rush. This will be interesting. DRC has a thigh bruise. Return questionable for the Giants.